Welcome to L.A.: Gateway to the USA. Last week L.A. Coalition chair Russell Goldsmith and Coalition members Ted Craver and Chris Martin joined Chance Barnett (CEO and founder of Crowdfunder) in a panel discussion. In 2014 the U.S. economy grew by 2.4%, a slight acceleration over the 2.0% growth in 2013. California’s economy grew by 2.9% in 2014, also an improvement over the 2012 to 2013 growth. C.L. Max Nikias the president of the University of Southern California penned an Op-Ed for the L.A. Times. Los Angeles World Airports (LAWA): The L.A. Coalition met with Gina Marie Lindsey the executive director of the Los Angeles World Airports and Sean Burton, the president of the Board of Airport Commissioners to discuss LAX modernization. 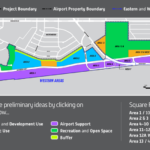 Los Angeles World Airports (LAWA): Global investors continue to look for opportunities to privately manage large public assets such as mid-size airports in the United States.